After a fall break full of trips and practices, Notre Dame looks forward to getting back into the pool when it hosts in-state rival Purdue on Saturday at Rolfs Aquatic Center. Irish junior Cat Galletti swims during Notre Dame’s dual meet victory over Valparaiso on Nov. 11 at Rolfs Aquatic Center. The Irish (2-3) traveled south to Georgia and Alabama on Oct. 17-18, going 1-3 in dual meets against Georgia Tech, South Carolina, Vanderbilt and Auburn in their latest action. 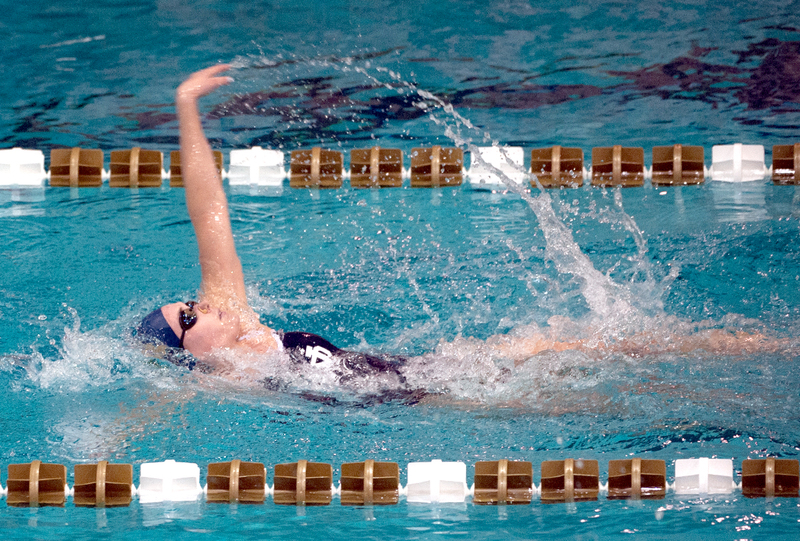 One of the Notre Dame’s strongest events so far this season has been the 200-yard medley relay, composed of sophomore Catherine Mulquin, senior Emma Reaney, senior Courtney Whyte and junior Cat Galletti. After qualifying for the NCAA championships last year, the team has won three times in the first month of the season, with a runner-up and third-place finish as well. “Each one of them individually is proficient in their stroke,” Irish interim coach Tim Welsh said of the relay team. “They’re all great competitors, and they just make a good relay. Another team unit that has gotten off to a flying start this season has been the divers. The combination of juniors Lindsey Streepey and Emma Gaboury and senior Allison Casareto have totaled five event victories among them already, including sweeping the diving events in the season-opening meet against Michigan State on Oct. 3 and the Dennis Stark Relays, which Notre Dame hosted the following weekend. On Saturday, the Irish divers will go up against their counterparts from the Boilermakers (2-1), who are among the top in the country. Welsh said the diving events will be some of the most interesting competitions to watch Saturday. 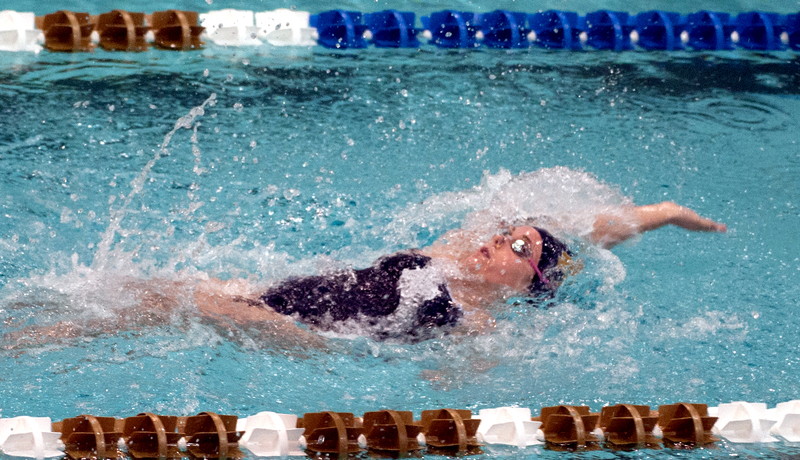 Irish senior Courtney Whyte races in a backstroke event in Notre Dame’s win over Valparaiso on Nov. 11 at Rolfs Aquatic Center. While the diving has been excellent to start the year, the swimmers have been quick off the blocks as well. Although the season is still very young, Notre Dame has totaled 18 swimming event victories through four meets thus far. However, Welsh said he and his staff are still tinkering with the lineups. That being said, Welsh said he sees a very good core group of girls for his team to build around. Welsh commented on how strong Whyte and Galletti have been for the Irish, and also mentioned senior Bridget Casey, the school record holder in the 200-yard butterfly, and sophomore Katie Miller, who competed in the 200- and 400-yard individual medleys, 200-yard backstroke and 800-yard freestyle relay at the NCAA championships as a freshman last year. “We need to rotate around that core,” Welsh said. When asked what he wanted to see out of the team in what he said was still early in the year, Welsh said his answer was very simple. The Irish will take to the pool against the Boilermakers on Saturday at 1 p.m. at Rolfs Aquatic Center.